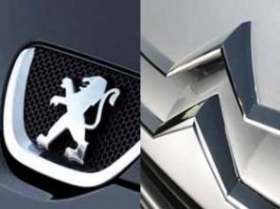 PARIS (Bloomberg) -- PSA/Peugeot-Citroen plans to sell at least 50 percent of its profitable Gefco trucking unit, more than previously discussed, as it seeks to raise cash amid slumping sales in Europe. "The chief executive told us that more than half of the shares would be sold," Patrice Clos, a FO union representative and head of Gefco's works council, said in a phone interview. Gefco CEO Yves Fargues provided the information at a works council meeting on Thursday, Clos said. The sale of a majority of the trucking unit "would mean that Gefco's earnings would get deconsolidated in Peugeot's accounts," Florent Couvreur, an analyst at CM-CIC Securities, said by phone. "This would basically mean a 20 percent cut in their operating income." PSA announced plans in February to sell assets, including a stake in Gefco, as the Paris-based carmaker grapples with European overcapacity and increasing debt. The French carmaker's sales in the EU and EFTA countries tumbled 14.9 percent to 675,323 in the first five months of 2012, outpacing an industrywide slump and causing its market share to drop to 12 percent from 13 percent, according to data from the ACEA industry group. Gefco, a fully-owned PSA subsidiary, has attracted eight bidders so far, and PSA plans to narrow the field to three by the end of July, Clos said. The deal is slated to close by early September, which would be a month later than previously scheduled, he said, adding that Fargues didn't provide details on valuation nor identify the bidders. Pierre-Olivier Salmon, a spokesman for PSA in Paris, declined to comment.